Lychee (also known as litchi) is a tropical to subtropical fruit that originated in southern China and northern Vietnam. 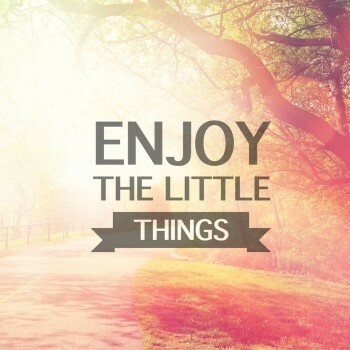 In Chinese, lychee (荔枝, lizhi) means ‘gift for a joyful life’. This aromatic fruit has a high sugar content, minerals and vitamins. It has a rough, indehiscent red pericarp, a succulent edible aril and a single seed in the center. It is a close relative to rambutan and longan. The texture of the lychee resembles grape and its taste like the combination of grape and pear. The pericarp color of lychee changes from green to reddish pink upon ripening. It has gain popularity as an exotic fruit with semi-translucent white aril and attractive red skin and has a sizeable international market now. The famous cultivars of lychee planted in Guangdong are ‘Sanyuehong (三月红)’, ‘Fezixiao (妃子笑)’, ‘Heiye (黒叶)’, ‘Nomici (糯米糍)’, and ‘Huaizhi (怀枝)’. The best cultivar is Nomici (糯米糍). Lychee is usually consumed directly as a fresh fruit. 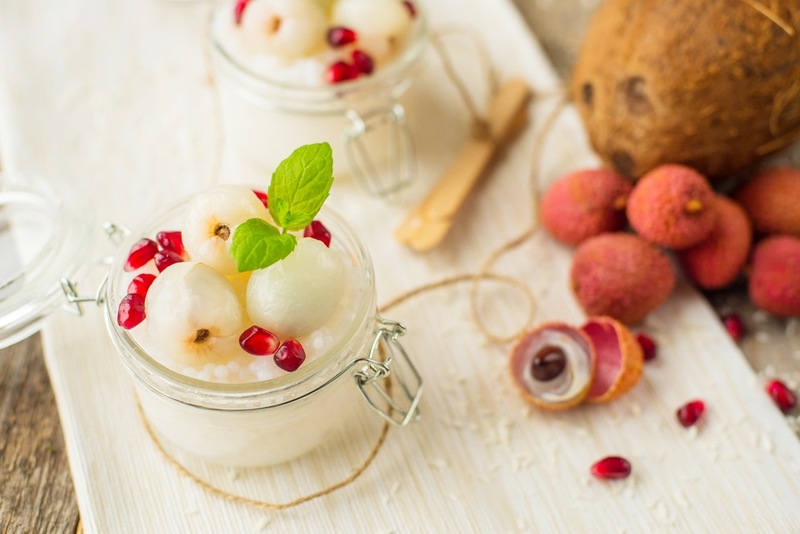 There are some lychee-derived foods also available in the market such as lychee arils, wine, juice and ice cream. Research conducted in recent years also revealed the pharmacological activities of lychee such as hypoglycemic, anticancer, antibacterial and antiviral functionalities. Comparison of lychee, rambutan and longan fruits. Lychee fruit is an important source of essential vitamins and minerals for humans. Consume 100 g of lychee fruit meet 2-4% of the daily recommended intake of 6 minerals, including P, K, Mg, Fe, Zn and Mn. Lychee fruit is also a nutritionally significant source of vitamin C, thiamine, riboflavin and niacin. The fresh of lychee fruit contains 72 mg/100g vitamin C. One lychee fruit provides 8% of daily recommended intake of vitamin C and 100 g lychee provides you 86%. The high content of vitamin B, functioning as cofactors of enzymes, is important in metabolizing carbohydrates, protein and fats. Lychee is one the richest sources of antioxidants among fruits. It has been reported to be second only to strawberries in terms of polyphenol content per edible part. 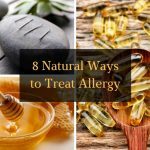 It is especially high in rutin (quercetin-3-rutinoside), a powerful antioxidant. Lychee also contains an ample amount of vitamin C and other flavonoids, such as polyphenols, kaempferol, anthocyanins and proanthocyanidins. These antioxidants exert a wide range of biological activities including anti-inflammation, anti-obesity, antidiabetic effects. Lychee fruit has been used in traditional Chinese medicine formulations, mainly serving for the relief of neural pain and swelling, since ancient times. In India, the powdered seeds of lychee fruit are traditionally used to relieve pain. 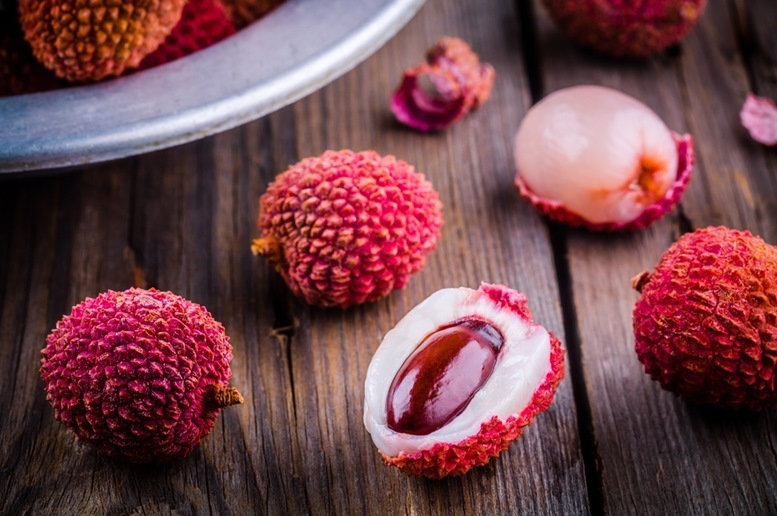 Lychee contains a group of special phytochemicals, oligonol, a mixture of low-molecular weight polyphenols combining both catechin-like monomer and low oligomers of proanthocyanidin. 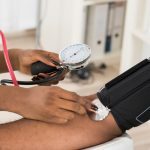 Studies have shown oligonol improves peripheral blood flow, endothelia function and lower blood pressure. Another polyphenol of lychee, rutin, has also been traditionally used to increase blood circulation. Moreover, one hundred grams of lychee provides 22% daily requirement of copper, the essential mineral for red blood cell production. Hence, lychee is a good choice for people with chronic vascular diseases with a limited flow of blood. Chronic inflammation is closely related to the development of various degenerative diseases. Lychee fruit has a wonderful therapeutic effect of suppressing inflammation in our body, especially due to its oligonol fraction. 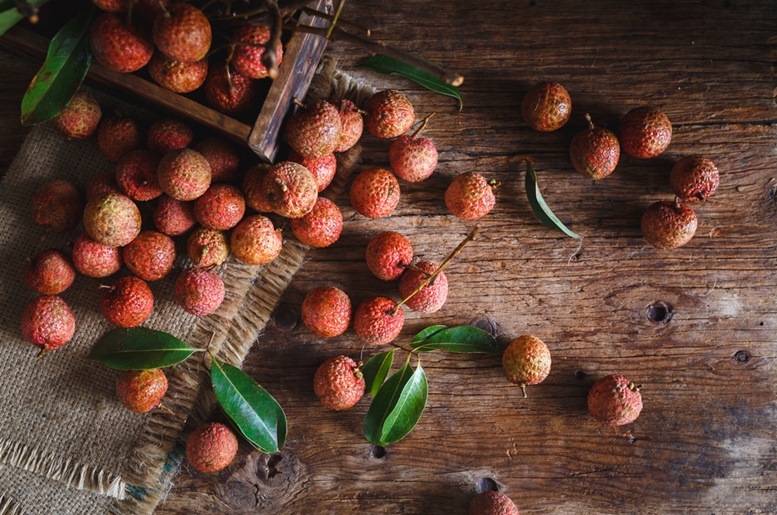 A study has demonstrated that athletes who took polyphenol-rich lychee extract had a lower inflammation and tissue damage caused by high-intensity exercise training. Lychee fruit is a significant source of potassium, an electrolyte that is important to keep body fluid balance. This help to maintain blood pressure, relieve pressure on the blood vessels and keep the rhythm of the heart beat. One cup of lychee provides 325 mg of 4700 mg daily requirement of potassium. Eating lychee helps you to balance out the negative effect excessive intake of salt from our diet and prevent the development of high blood pressure. The high content of vitamin C of lychee fruit strengths our immunity and boosts the generation of white blood cells to against infections. 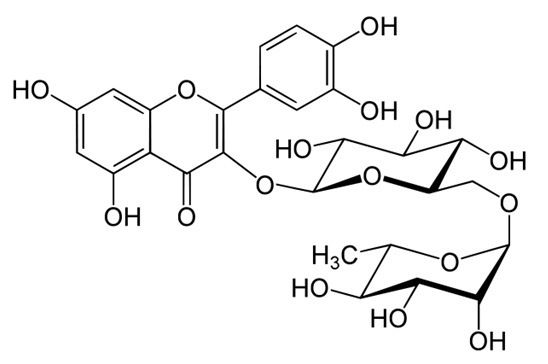 Also, the oligonol fraction of lychee has an anti-influenza effect, preventing the infection of influenza virus. The high antioxidants content of lychee plays an important role in fighting heart diseases. 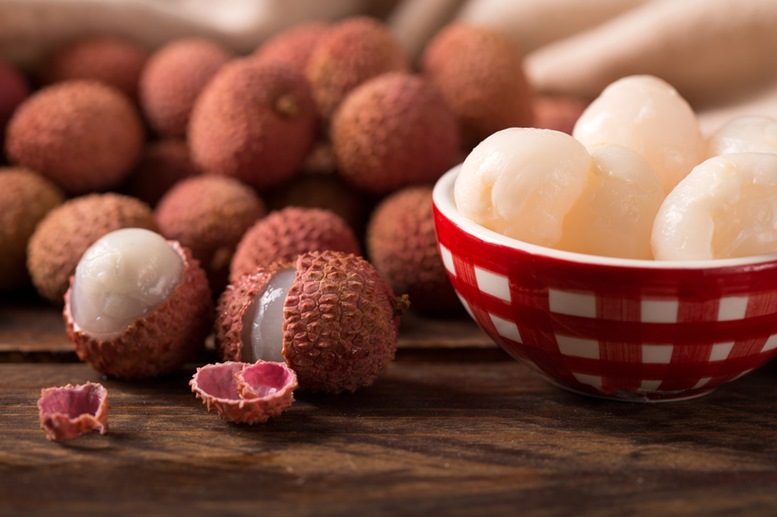 Research has shown that antioxidants of lychee reduce the amount of harmful low-density lipoprotein (LDL) cholesterol and increase the amount of good high-density lipoprotein (HDL) cholesterol in our body. The antioxidants prevent the oxidation of LDL cholesterol, stifling atherosclerosis in the cradle and lowering the risk of the heart diseases and stroke. Lychee possesses a powerful anti-tumor activity which attributed to the significant amount of polyphenols it offers. Polyphenols of lychee, as strong antioxidants, scavenge free radicals and carcinogens and protect our cell DNAs from harmful mutation. 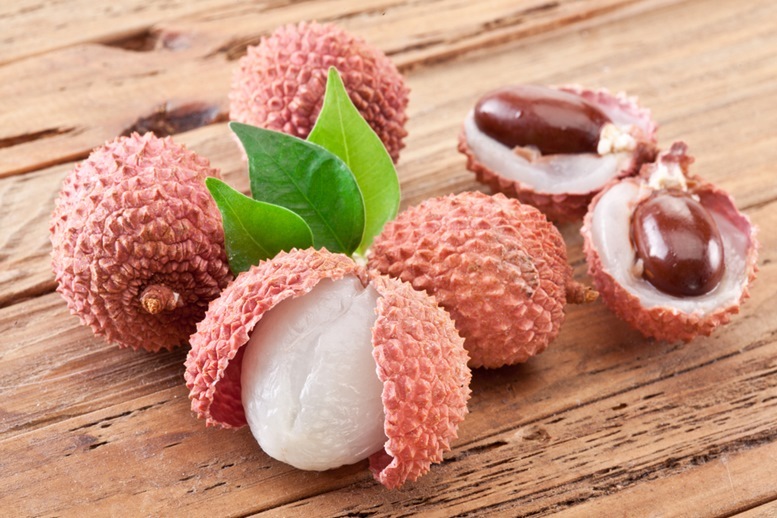 Animal studies have demonstrated that lychee extract prevented the growth of breast cancer cells. Lychee contains a handful of nutritious phytochemicals that is beneficial for your skin. The rich content of antioxidants of lychee prevent aging, reduce the formation of wrinkles, blemish and sunburn. Oligonol of lychee protects our skin from UV radiation. Lychee is a healthy fruit and moderate consumption is recommended. However, excessive ingestion of lychee might cause advise effects. Diabetic patients are not recommended to eat lychee because of its high sugar content and glycemic load. Some people are allergic to lychee fruit. They experience skin erythema and throat swelling when they consume fresh lychee fruit. In Chinese culture, lychee is a ‘heaty’ fruit. Eating too many lychee might cause bleeding nose, sore throat and even fever. According to the wisdom of traditional Chinese medicine, excessive consumption of lychee leads to hypoglycemia, fever, seizure and unconsciousness. 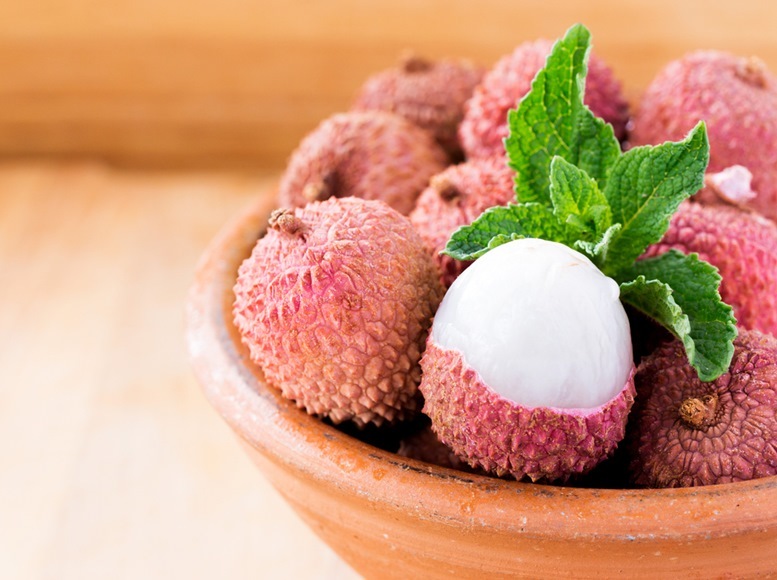 Lychee belongs to the soapberry family. Lychee is sometimes known as ‘Chinese Strawberry’ because it looks like the strawberry and originated in China. Lychee is a non-climacteric fruit which means it can only be harvested after attaining full maturity on the tree. Lychee fruits are harvest in bunches. The seed of the lychee fruit is toxic. It upset our digestive system when ingested. The lychee tree can grow to up to 10-28 meters. Lychee flowers bloom from November to February. The fruit ripens 3-4 months after pollination. The skin of the lychee turns brown when stored in room temperature, but the flesh remains unchanged. Lychee has a very short shelf life. 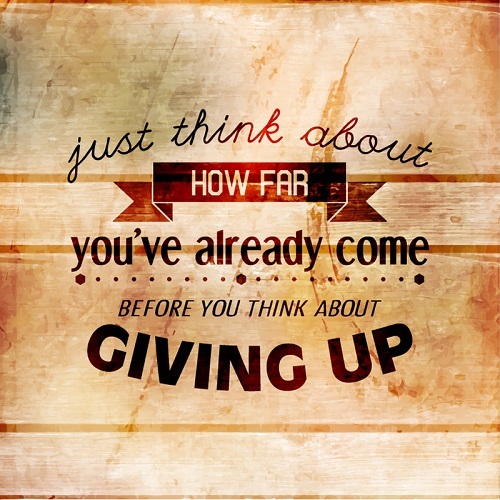 Even the one stored in the fridge has only a 5-7 days shelf life. 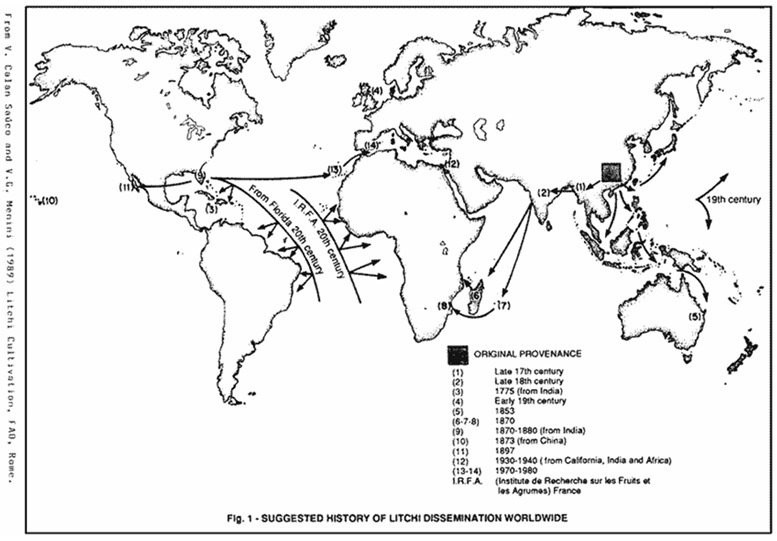 The cultivation of lychee was dated to the Christian era in China. 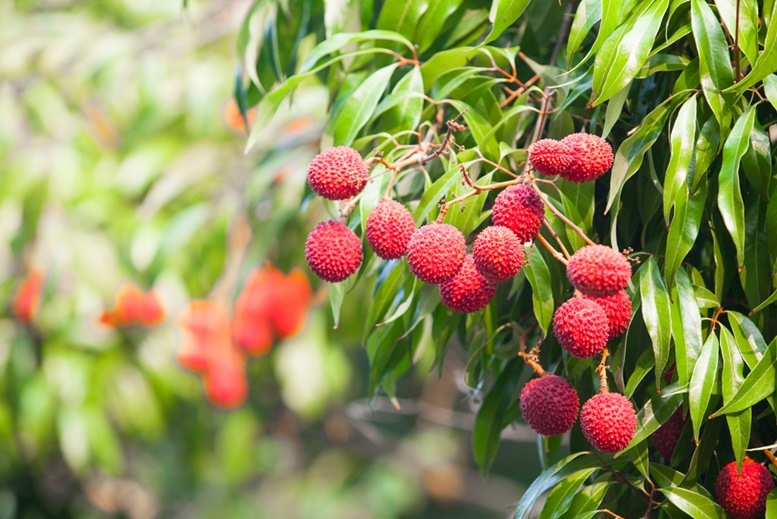 Nowadays, lychee is found in most countries of Latin America as well as in the Caribbean, India, Thailand, Mauritius, Africa, Australia, Israel and many other countries. There are about 68 cultivars of lychee grown commercially in the world.China is the leading lychee-producing country in the world. 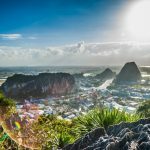 In China, Guangdong province is the “Kingdom of Lychee” because of the best quality and the highest production of lychee from this province. Lychee is grown as a commercial crop in China, South Africa, Israel, Madagascar, India, Pakistan, the Philippines, Thailand, Taiwan, Indonesia, Vietnam, and Brazil. Asian countries produce more than 90% of the world’s lychee. Lychee fruit sales make a significant contribution to the economic growth in these countries, especially those in Southeast Asia. Most lychee fruit produced in Asia are marketed locally, with some exports to Hong Kong, Malaysia, and Singapore and fewer exports to Europe and the Middle East. The production of lychee has increased steadily over the years. In China, the production of lychee doubled since the early 1900sdue to the improvement of the cultivation technology. 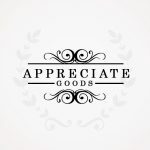 There is an increase in exports from both southern and northern hemisphere production areas into Europe and North America. The European market only imports approximately 20,000 tons of lychee per year. France imports around 50% of these, and the rest is mainly imported by Germany and the United Kingdom. 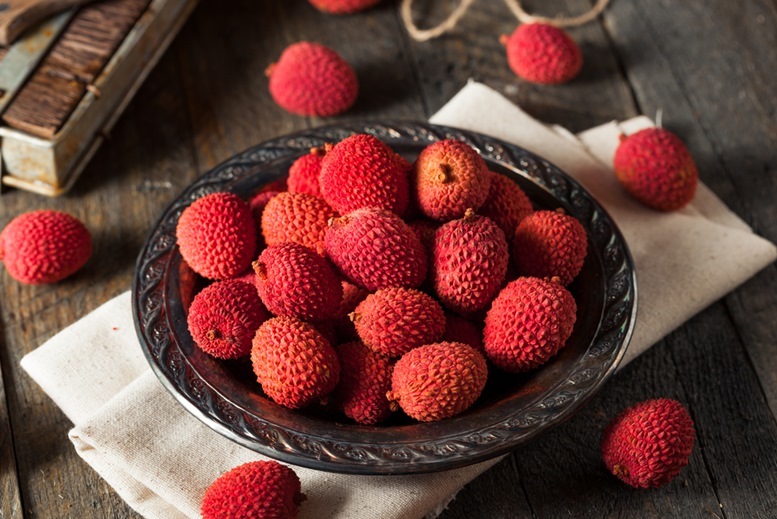 Further market expansion of lychee is expected with the recent development of postharvest and preservation technologies.